Yes it is the 1st of July and although this year it is chilly and raining outside we will not let that (excuse the pun) dampen our spirits. Today is all about celebrating everything that makes Canada great and you know what makes Canada great? Canadian dogs! Like with Canadian human’s and their amazing inventions and achievements; it has come to my attention that many of my famous canine compatriots are not known to be… well, Canadians! To remedy this situation, I decided to start a new Canada Day tradition here on the blog: Meeting and interviewing famous Canadian dogs! Wether they be working dogs, show dogs, hero’s or fashion maven’s, I will select a category every year to track down and interview (and hopefully meet in person. Road trips!). Then I will share with you the Top 3 for that years category on the 1st of July to help celebrate Canada Day with some interesting and adorable dogs. It will not matter if they were born in this wonderful country of ours, or wether they – like me – immigrated, as long as they are currently living in Canada as Canadians. And yes it is ok if they have dual citizenship! So without further ado let me introduce you to this years top 3 famous Canadian Dogs! This years category: Social Media Superstars! #1 – Crusoe the Celebrity Dachshund! Famous for his costumed viral videos (Batdog, Captain Crusoe, Chef Crusoe and a few with his brother that include Cops and Robbers, Nurse and Doctor and even Minions!) 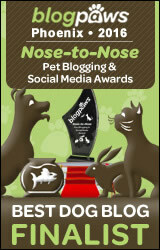 and for being the winner of the best pet blog three years in a row (including bloggies 2015). He and his bipeds have been seen on Good Morning America, GoPro, Mashable & more. He has a hugely active and popular FB page and now a book deal! Crusoe is hands down Canada’s top Social Media Superstar! I was incredibly humbled to interview him in my home and thrilled that he agreed to do so. Why do you like being Canadian? Well, mainly because I’m Canadian to begin with; I was born here. I love Canada because it’s my home, it has lots of space to run around in, it has mountains and plains and beautiful forests, it has pronounced seasons, and the people here are kind. Where is your favourite place in Canada? I haven’t yet had the chance to travel all across Canada, so I cannot say definitely, but right now my favourite spot is the Laurentians of Quebec, near Mont Tremblant. This is where I grew up and is still where I escape to every once in a while having a chalet there. Where in Canada would you like to visit? I would love to visit British Columbia to experience the grandeur of the Rockies! We discovered Dexter the “talking dog” and his sidekick Peppermint a few years back and have been fans ever since. And we are NOT alone! Famous for their YouTube videos (see the best intro to them here!) and their witty repartee these two are a wonderful comic duo. I want to add that I also really like their biped. She seems so patient to me! You can find them on Facebook and on Instagram as well! Both of these Social Media Super Stars are Yorkies. Dexter (who has a slight yet endearing speech impediment) has the most hilarious views of the “hooman” world I have ever come across (we really love his views on dating his Mom!). And Peppermint… well she is my online crush of all times. She is just way way smart and I love me a clever girl! We have yet to meet in person, but next time we are in Toronto we plan on fixing that! Why do you two like being Canadian? We has only ever been to Toronto, Canada, really. so at dis point it’s our favourite. Where in Canada would you both like to visit and why? ALL OF IT! Mommy has a grand idea of getting a van and shooting cross Canada road trip adventure videos with us in tow the whole time, but she’s a bit of a dreamer. Maybe one day. But We would really likes to visit both coasts. There is such diversity from one end of da country to the other! New to us, but not to the rest of the country is this social media (in particular Facebook) Comedian! Born in Quebec and a rescue his story will warm your heart! His Facebook page is filled with fun antics and adorable “weiner” photo’s. Known for his “funny tail” (it was broken at some point before finding his forever home) it never goes up like a regular dog. His Mom calls it the “sweeper” and it is by far the fastest tail of the Great White North! Rusty RuRu uses is social media fame to raise awareness on rescues and all sorts of other charities. He is not only a social media superstar he is also a philanthropist. My most favourite place in Canada is my Vet’s office, nahhhh just kidding, I love my dog park, it’s off leash and I get to see a lot of my friends. One place I would like to visit in Canada would have to be, Peterborough, as that is where my boy is studying and I miss him very much. Thank you for the interview, it was fun. Woof Woof. And thank YOU!!! All of you for letting me sit in your lime light for the day. That is it for this years’ instalment. If you know of any famous Canadian dogs that you would like to see featured on our Canada Day special next year, please leave a comment and some details below! Now go out there and enjoy the festivities!! HAPPY CANADA DAY! The Best Interview With Bolt and Keel the Traveling Cats! From The Pages of European Comics – Travelling Dog Heroes! ← Taking Swiss Public Transportation With a Dog! I love this section ! How adorable! McQueen will be on this sweet list next year! Lol Vienna and Mia should be on and Canada’s best designers couture models! Don’t know what the category will be next year! Maybe it will be fashion (in that case yes fro McQueen and Yes of course Mia and Vienna and the whole presented at the Oscars thing for sure!) or it could be “in film” or it could be working dogs or show dogs or maybe even “unsung heroes” featuring sniffer dogs, military dogs and police dogs. We have not yet decided. It’s a WHOLE YEAR away so we have time! Great post. I don’t know why my biped mother won’t help me start my blog. After all, when she posts a photo of me on her FB page, that gets the most “likes” and improves her Klout score. I’m happy to help help her out, but I’m feeling a little used. PS: Looking forward to seeing you soon, Monte. We can play chase, but maybe this time you shouldn’t nudge me out of my own bed. It’s kind of rude, Dude. I will try and talk to your Mom Dino. ‘Cause yeah … she is totally using you man! Not cool. Hoping your up for a game of chase when I arrive. Was fun last time! And as for the bed – well… snooze you loose. Just sayin. I am not familiar with Iggy Joey… is there a website? I always loving meeting “pet celebrities” we met online. We get to meet a lot of them every year at BlogPaws. I also travel to Vancouver, BC to meet up with some our bestest pals. One day — one day I will make it to BlogPaws and meet YOU! !